Artists E.V. Day and Kembra Pfahler have transformed the Bowery’s Hole Gallery into a lush indoor park, complete with fresh grass, fragrant flowers, and even a pond! 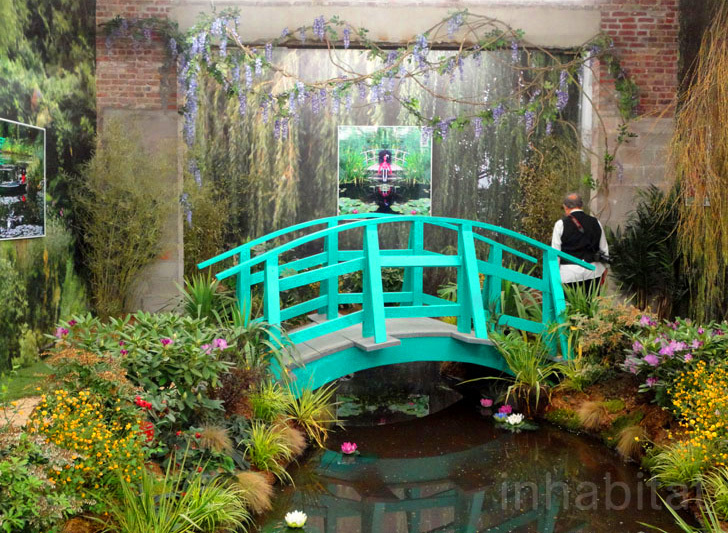 Inspired by the French gardens Claude Monet immortalized in his paintings, the exhibition features photographs taken in the gardens of Giverny, hung amidst the lilypads, vines, hyacinths, and willow trees planted within the gallery. The collaborative exhibition welcomes guests to experiences a taste of the French countryside right in the East Village. When stepping into the gallery, visitors are first greeted with the wafting sweet fragrance of fresh flowers, which grow around the architectural pillars, along walls and in vines hanging from the ceiling. Manicured pathways of white gravel crunch under foot, as they lead around the indoor garden. Planted rolls of sod and grass line the gravel pathways, and surround mounds of flower beds, blooming in pinks, whites and purples. The gardens are centered around a trickling pond, full of lilypads blooming with crocuses, which can be traversed by walking over an arched turquoise bridge. The spirit of the outdoors is extended by wallpapering the gallery walls with rich scenes of forests and gardens. On each wall, a photograph of Pfahler hangs. The artist, whose work involves portraying an alter ego called Karen Black, paints herself in vibrant colors as part of her performances. The photographs were taken at Giverny, as part of Day’s duration in the Munn Artists Residency at the gardens, supported by the Versailles Foundation. The photographer captured Pfahler’s iconic vibrant caricature, as posed within the serene landscape of the Giverny gardens. The resulting body of work blends the two artists styles and oeuvres, while inviting the visitor to be transported to a replicated scene of where the works were created. A gardener is on hand to take care of the exhibition during its run, as well as an “en plein air” painter, who was painting a canvas on the day of Inhabitat’s visit. Giverny at The Hole closes Tuesday, April 24, 2012. When stepping into the gallery, visitors are first greeted with the wafting sweet fragrance of fresh flowers, which grow around the architectural pillars, along walls, and in vines hanging from the ceiling. Manicured pathways of white gravel crunch under foot, as they lead around the indoor garden. Planted rolls of sod and grass line the gravel pathways, and surround mounds of flower beds blooming in pinks, whites, and purples. The gardens are centered around a trickling pond, full of lilypads blooming with crocuses, which can be traversed by walking over an arched turquoise bridge. The spirit of the outdoors is extended by wallpapering the gallery walls with rich scenes of forests and gardens. On each wall, a photograph of Pfahler hangs. The artist, whose work involves portraying an alter ego called Karen Black, paints herself in vibrant colors as part of her performances. The photographs were taken at Giverny, as part of Day’s duration in the Munn Artists Residency at the gardens, supported by the Versailles Foundation. The photographer captured Pfahler’s iconic vibrant caricature, as posed within the serene landscape of the Giverny gardens. The resulting body of work blends the two artists styles and oeuvres, while inviting the visitor to be transported to a replicated scene of where the works were created. A gardener is on hand to take care of the exhibition during its run, which ends April 24, 2012, as well as an “en plein air” painter, who was painting a canvas on the day of Inhabitat’s visit.